Earth Science Week was launched by the American Geosciences Institute (AGI) in 1998 “to help the public gain a better understanding and appreciation for the earth sciences and to encourage stewardship of the Earth.” Over time, the annual event has set its chief focus on K-16 teachers and students, working to build interest in the geosciences—in classroom teaching, college majors, and ultimately the geosciences workforce. While learning about what the geosciences workforce does every day is an overarching goal, a deeper foundational motivation is clear from a story in the December 2011 issue of Earth magazine, “Jobs, jobs everywhere, but not enough people to fill them.” In short, the article peers into 2021 and predicts that the need for geoscience jobs will grow far faster than the current stream of incoming geoscience graduates are entering the workforce. The combination of rapidly advancing Baby Boom generation retirements and constrained flow of new qualified entrants equates to a potential gap of 145,000 to 202,000 geoscience jobs left unfilled by 2021. It is clear that, both individually and collectively, we need to help close this gap by working with AGI and other organizations, including our local educational institutions, to foster student curiosity and engagement in these fields and careers. Earth Science Week 2012 runs October 14th to 20th, but in many ways this is the kick-off of a year’s worth of exploration. The Earth Science Week web site points to an array of resources and activities that educators, students, and the public can access. More than 16,000 educational kits have already been sent to schools across the country. Each kit contains a range of timeless educational resources including a calendar of monthly lessons produced by Earth Science Week sponsors and supporters. A sponsor of Earth Science Week since 2005, Esri has this year produced an activity on geospatial careers for November, providing a tie to GIS Day, and a print resource pointing educators to the Esri Education Community. 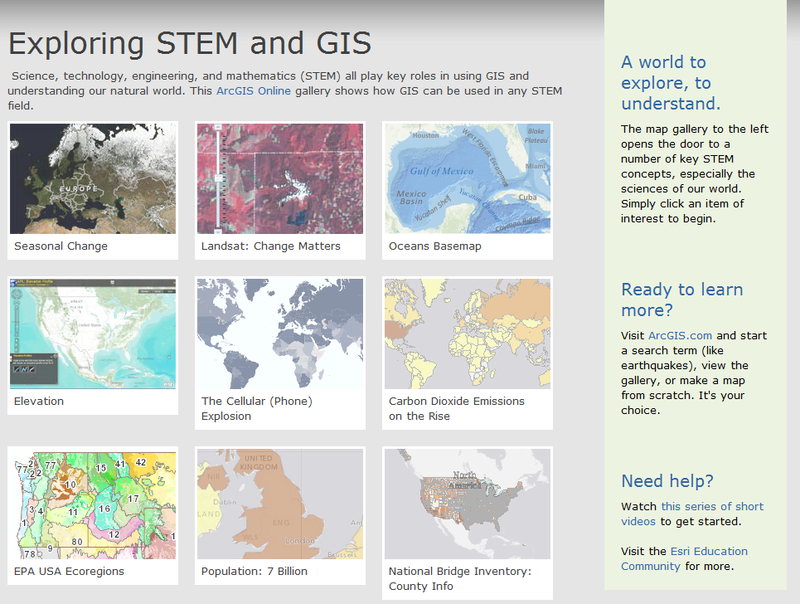 This includes ready-made ArcGIS Online maps, apps, and galleries with an education focus like the STEM GIS gallery.